ompTIA’s Network+ exam has a unique position in the IT industry in that it’s one of those certifications that act as a stepping-stone to so many other certifications. It does this by testing the core knowledge of how networks function without concentrating on any specific vendor. This non-vendor-specific attitude makes Network+ attractive to those who need to understand networking. The networking side of our business clearly doesn’t suffer from a lack of vendor-specific tests and certifications, and these certifications provide a great way to get (and keep) a job. The Microsoft Certified Professional (MCP), Microsoft Certified Systems Administrator (MCSA), Microsoft Certified Systems Engineer (MCSE), and Certified Novell Engineer (CNE), as well as a few niche players like the Cisco Certified Network Associate (CCNA) and Cisco Certified Internetwork Expert (CCIE), have opened doors for many who have decided to pursue those certifications. The vendor-specific certifications, however, fail to address one important group of people: those who have basic skills that apply to any type of network. These are the people who have taken the time to understand conceptually how computers and networks operate. These general practitioners form the cornerstone of the IT industry. They set up Windows systems to link into Windows, Novell, and Linux networks. They know how to set the TCP/IP information to access the Internet. They know a network cable from a telephone cable. The vendor-specific certifications fail to test these more generic skills comprehensively. Further, attaining a vendor-specific certification can cost you a lot in terms of time and money. For many of these vendor-specific certifications, you must take a series of tests to get the full certifications. The tuition for courses or boot camps, or even the self-study programs, and the amount of work involved in getting those certifications, can be intimidating. By contrast, with the vendor-neutral Network+ Certification you take only one test and get a lifelong certification that never needs updating. Most techs get their Network+ Certification after becoming A+ certified. Network+ opens the way to several certification paths for those interested in continuing their certifications. Over the past several years, companies offering vendor-specific certifications have begun to respect the need for a Network+ Certification. In fact, many have adopted the Network+ certifications into their programs. If you pass CompTIA’s A+ and Network+, you receive credit for one of the four exams needed to achieve your Microsoft Certified Systems Administrator (MCSA). Want another example? How about Novell certifications? After you become Network+ certified, Novell automatically notifies you that you have received credit for its Network Technologies test. Hence, if you decide to focus on Novell, you will already have one test under your belt! Welcome to Network+ Certification! Who Needs Net+? I Just Want to Learn About Networks! Whoa up there, amigo! Are you one of those folks who’s either never heard of the Network+ exam or just doesn’t have any real interest in certification? Is your goal only to get a solid handle on the idea of networking and get yourself a jumpstart on the basics? Are you looking for that “magic bullet” book that you can read from the beginning to the end and then close the book and start installing and troubleshooting a network? Do you want to know what’s involved with running network cabling in your walls or getting your new wireless network working? Are you tired of not knowing enough about what TCP/IP is and how it works? If these types of questions are running through your mind, then rest easyyou have the right book. Like every book with the Mike Meyers name, you’ll get solid concepts without pedantic details or broad, meaningless overviews. You’ll look at realworld networking as performed by real techs. This is a book that understands your needs, well beyond the scope of a single certification. If the Network+ exam isn’t for you, you can skip the rest of this chapter, shift your brain into learn mode, and dive into Chapter 2. But then, if you’re going to have the knowledge, why not get the certification? experience should have. CompTIA recommends A+ knowledge or background but doesn’t require an A+ Certification to take the Network+ exam. You achieve a Network+ Certification by taking one computer-based, 72-question, multiple-choice exam. To date, nearly 160,000 technicians have become Network+ certified. Network+ Certification enjoys wide recognition throughout the IT industry. At first, it rode in on the coattails of the successful A+ Certification program, but it now stands on its own in the networking industry. Having a Network+ Certification notably improves your ability to get and keep a job. It also serves as a stepping stone to more networking certificate programs. The Current Network+ Certification Exam Release CompTIA constantly works to provide tests that cover the latest technologies and, as part of that effort, they periodically update their test objectives, domains, and test questions. In 2002, CompTIA released the newest version of the Network+ exam. This book covers all you need to know to pass the 2002 revision of the Network+ Certification exam. How Do I Become Network+ Certified? To become Network+ certified, you simply pass one computer-based, multiple-choice exam. There are no prerequisites for taking the Network+ exam, and no networking experience is needed. You’re not required to take a training course or to buy any training materials. The only requirements are that you pay a testing fee to an authorized testing facility and then sit for the exam. Upon completion of the exam, you will immediately know whether you passed or failed. Once you’ve passed, you become Network+ certified. That’s it—there are no annual dues and no continuing education requirements. Now for the details. CompTIA recommends that you have at least nine months of experience and A+ knowledge, but this is not a requirement. You may not need to have experience or A+ knowledge but, believe me, both of these help! The A+ exam has a strong degree of overlap with the Network+ and covers other issues, such as types of connectors. As for experience, keep in mind that Network+ is mostly a practical exam. Those who have been out there supporting real networks will find many of the questions reminiscent of the types of problems they’ve seen on local area networks (LANs). The bottom line is that you’ll probably have a much easier time on the Network+ exam if you have some A+ experience under your belt. In the past, CompTIA has made changes to the content of the exams, as well as the score necessary to pass it! Count on that trend to continue. Do not assume they’ll wait for a major revision! Always check the CompTIA web site before scheduling your exam. Be prepared! you all you need to know. While this model rarely comes into play during the daily grind of supporting a network, you need to know the functions and protocols for each layer to pass the Network+ exam. You can also expect questions on most of the protocol suites, with heavy emphasis on the TCP/IP suite. How Do I Take the Tests? While you can’t take the exam over the Internet, both Prometric and Pearson VUE provide easy online registration; go to www.prometric.com or www.vue.com. CompTIA requires any company that resells vouchers to bundle them with some other product or service. Because this requirement is somewhat vague, voucher resellers have been known to throw in some pretty lame stuff, just to meet the requirement and keep their overhead low. My company, Total Seminars, is an authorized CompTIA member and voucher reseller, and we bundle our Network+ vouchers with something you can actually use: our excellent test simulation software. It’s just like the disc in the back of this book but with hundreds more questions to help you prepare for the Network+ exam. If you’re in the U.S. or Canada, you can visit www.totalsem.com or call 800-446-6004 to purchase vouchers. As I always say, “You don’t have to buy your voucher from us, but for goodness’ sake, get one from somebody!” Why pay full price when you have a discount alternative? To take the tests, you must go to an authorized testing center. You cannot take the test over the Internet. Prometric/Thomson and Pearson VUE administer the actual Network+ tests. You’ll find thousands of Prometric and Pearson VUE testing centers scattered across the United States and Canada, as well as in over 75 other countries around the world. You may take the exam at any testing center. In the United States and Canada, call Prometric at 888-895-6116 or Pearson VUE at 877-551-7587 to locate the nearest testing center and schedule the exam. International customers should go to CompTIA’s web site at www.comptia.org, navigate to the Network+ area of the site, and look under the General Information area for a heading called Exam Locations. How Much Does the Test Cost? CompTIA fixes the price, no matter what testing center you use. The cost of the exam depends on whether you work for a CompTIA member. At press time, the cost for non-CompTIA members is $207 (U.S.). If your employer has a CompTIA membership, you can save money by obtaining an exam voucher. In fact, even if you don’t work for a CompTIA member, you can purchase a voucher from member companies and take advantage of significant member savings. You simply buy the voucher, and then use the voucher to pay for the exam. Most vouchers are delivered to you on paper, but the most important element is the unique voucher number, which you’ll generally receive via e-mail from the company that sells you the voucher. That number is your exam payment, so protect it from prying eyes until you’re ready to schedule your exam. You must pay for the exam when you schedule, either online or by phone. If you’re scheduling by phone, be prepared to hold for a while. Have your Social Security number (or the international equivalent) and either a credit card or a voucher number ready when you call or begin the online scheduling process. If you require any special accommodations, both Prometric and VUE will be able to assist you, although your selection of testing locations may be a bit more limited. International prices vary; see the CompTIA web site for international pricing. Of course, prices are subject to change without notice, so always check the CompTIA web site for current pricing! with as little as nine months of experience—so keep it simple! Think in terms of practical knowledge. Read the book, practice the questions at the end of each chapter, take the practice tests on the CD in the back of the book, review any topics you missed, and you’ll pass with flying colors. Is it safe to assume that it’s probably been a while since you’ve taken an exam? Consequently, has it been a while since you’ve had to study for an exam? If you’re nodding your head yes, you’ll probably want to read the next sections. They lay out a proven strategy to help you study for the Network+ exam and pass it. Try it. It works. Obligate Yourself The first step you should take is to schedule the exam. Ever heard the old adage that heat and pressure make diamonds? Well, if you don’t give yourself a little “heat,” you’ll end up procrastinating and unnecessarily delay taking the exam. Even worse, you may end up not taking the exam at all. Do yourself a favor. Determine how much time you need to study (see the next section), then call Prometric or Pearson VUE to schedule the exam, giving yourself the time you need to study, adding a few extra days for safety. Afterward, sit back and let your anxieties wash over you. Suddenly, it will become a lot easier to turn off the television and crack open the book! Keep in mind that Prometric and Pearson VUE let you schedule an exam only a few weeks in advance, at most. If you schedule an exam and can’t make it, you must reschedule at least a day in advance or lose your money. Set Aside the Right Amount of Study Time After helping thousands of techs get their Network+ Certification, we at Total Seminars have developed a pretty good feel for the amount of study time needed to pass the Network+ exam. Table 1.1 will help you plan how much study time you must devote to the Network+ exam. Keep in mind that these are averages. If you’re not a great student or if you’re a little on the nervous side, add another 10 percent. Equally, if you’re the type who can learn an entire semester of geometry in one night, reduce the numbers by 10 percent. To use this table, just circle the values that are most accurate for you and add them up to get the number of study hours. A complete neophyte will need at least 120 hours of study time. An experienced network technician with A+ and MCSE or CNE will only need about 24 hours. Keep in mind that these are estimates. Study habits also come into play here. A person with solid study habits (you know who you are) can reduce the number by 15 percent. People with poor study habits should increase that number by 20 percent. The total hours of study you need is __________________. Studying for the Test Now that you have a feel for how long it’s going to take, you need a strategy for studying. The following has proven to be an excellent game plan for cramming the knowledge from the study materials into your head. Historical/Conceptual It’s not on the Network+ exam, but it’s knowledge that will help you understand more clearly what is on the Network+ exam. Test Specific Topics that clearly fit under the Network+ Certification domains. Historical/Conceptual sections in that chapter. Be aware that you may need to skip back to previous chapters to get the Historical/Conceptual information you need for a later chapter. After going through every chapter as described, take the free practice exams on the CD-ROM that accompanies the book. First, do them in practice mode, and then switch to final mode. Once you start hitting in the 80–85 percent range, go take the test! Brainiacs should first read the book—the whole book. Read it as though you’re reading a novel, starting on Page 1 and going all the way through. Don’t skip around on the first read-through, even if you are a highly experienced tech. Because there are terms and concepts that build on each other, skipping around will confuse you, and you’ll just end up closing the book and firing up your favorite PC game. Your goal on this first read is to understand concepts—to understand the whys, not just the hows. It’s helpful to have a network available while you’re doing each readthrough. This gives you a chance to see various concepts, hardware, and configuration screens in action when you read about them in the book. Nothing beats doing it yourself to reinforce a concept or piece of knowledge! You will notice a lot of historical information—the Historical/Conceptual sections—that you may be tempted to skip. Don’t! Understanding how some of the older stuff worked or how something works conceptually will help you appreciate the reason behind networking features and equipment, as well as how they function. After you have completed the first read-through, cozy up for a second. This time, try to knock out one chapter at a sitting. Concentrate on the Test Specific sections. Highlight the phrases and sentences that bring out major points. Take a look at the pictures and tables, noting how they illustrate the concepts. Then, do the end of chapter questions. Repeat this process until you not only get all the questions right, but you also understand why they are correct! Once you have read and studied the material in the book, check your knowledge with the practice exams included on the CD-ROM at the back of the book. The exams can be taken in practice mode or final mode. In practice mode, you are allowed to check references in the book (if you want) before you answer each question, and each question is graded immediately. In final mode, you must answer all the questions before you are given a test score. In each case, you can review a results summary that tells you which questions you missed, what the right answer is, and where to study further. Use the results of the exams to see where you need to bone up, and then study some more and try them again. Continue retaking the exams and reviewing the topics you missed until you are consistently scoring in the 80–85 percent range. When you’ve reached that point, you are ready to pass the Network+ exam! If you have any problems or questions, or if you just want to argue about something, feel free to send an e-mail to me at michaelmtotalsem.com. 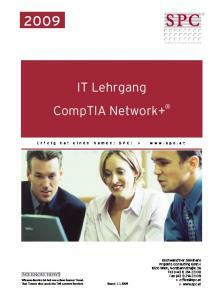 For additional information about the Network+ exam, contact CompTIA directly at its web site: www.comptia.org. Good Luck! Report "1 Introduction. CompTIA s Network+ exam has a unique position in the IT industry in that"